Rep. Steny Hoyer: “My expectation is that it will be incorporated into legislation that will pass Congress later this week." WASHINGTON -- Congress is likely to pass legislation this week that would give rejected General Motors Co. and Chrysler Group dealerships access to third-party arbitration under criteria more favorable to dealers than the automakers envisioned, the House's No. 2 Democrat said today. 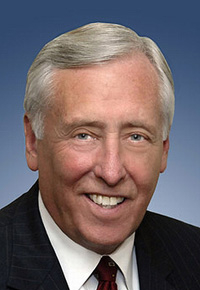 House Majority Leader Steny Hoyer, D-Md., said he and Sen. Richard Durbin, D-Ill., the Senate's No. 2 Democrat, were “very close” to an agreement on legislative language that probably would have the support of other dealer advocates in the House. The Hoyer-Durbin talks are still fluid, and it's not completely clear yet what kind of language will emerge, a congressional aide said. The legislation would be attached to a financial services spending bill by a conference committee formed to resolve differences in legislation passed by the House and Senate, a National Automobile Dealers Association spokesman has said. NADA has been lobbying for the bill. Hoyer reinforced that plan for the legislation today in a meeting with reporters at the Capitol. “My expectation is that it will be incorporated into legislation that will pass Congress later this week,” he said. The bill then would go to President Barack Obama for his signature. Durbin declined to comment. He has been more skeptical than Hoyer of dealer requests, and he could tip the balance of the legislation more to the automakers, a congressional aide said. The legislation would give 2,100 rejected dealerships the opportunity to appeal their closures and planned eliminations to third-party arbitrators, Hoyer told reporters. This process is nearly identical to that announced last week by GM and Chrysler when they broke off settlement talks aimed at providing an alternative to legislation. What's different are the criteria to be used by third-party arbitrators in considering dealer appeals. Dealer advocates have criticized the automakers' criteria as circular and self-fulfilling. Few franchises would be restored under those criteria, they have said. Under this proposal, the arbitrator is directed to consider the dealer's experience, past profitability, current economic viability and the demographics and geography of the local market. Hoyer today didn't say whether the language that he and Durbin were considering would adhere precisely to this proposal. But he made clear that it would go beyond the automakers' plans by allowing third-party arbitrators to apply broader criteria to dealers' appeals. Any legislation approved by a conference committee of congressional leaders has to be passed by both the House and Senate before it goes to the president. The new legislation would fall well short of what rejected dealers had sought in lobbying for a bill that would reverse their terminations. That bill passed the House last summer but stalled in the Senate and was opposed by Obama. Chrysler shuttered 789 stores during bankruptcy proceedings in May. GM targeted 1,350 outlets for elimination by October 2010.